BEST today announced that henceforth all buses would stop at bus stops for atleast two minutes irrespective of whether passengers boarded or disembarked. This announcement came following the speech by former Prime Minister Dr. Manmohan Singh in the Rajya Sabha where he quoted British economist John Maynard Keynes and said “In the long run we are all dead” yesterday. A boy running to catch a bus (Representative). Image copyright Fengalon. Image in Public Domain. When contacted, BEST chairman Mohan Ramchandra Mithbaokar was unavailable to comment. We were told by his assistant that the new move was to give commuters ample time to reach the bus stop. “If people run to catch a bus, it could be dangerous, they might die,” we were told. “Hence, the order was issued that all buses would stop for a few minutes to allow those running to slow down and walk to the bus. We are also planning to insure people who buy tickets in case the long run kills them,” he added. We just hope that whenever these happen, nobody will die in the long run. Note: All content in this article is fictitious, and must not be taken seriously. This article is satire, and should ideally be treated as such. Cupertino: A day after Apple announced the new iPhone 7, iPhone 7 Plus and Apple Watch 2, Apple has announced a new feature in the iPhone 7 that is bound to excite users, mainly in what is seen as an attempt to explain why the new phones do not have a 3.5mm headphone jack. Independent and out of work reporter Aapil Saathukudinathan managed to sneak in through the air ducts of Apple’s head office at 1, Infinity Loop and hold a developer hostage with smelly socks till he divulged details of Apple’s top secret plans. Apple is working on revolutionising the Transportation sector. They’re planning to take on Uber, Tesla, General Motors head on. For the past six years, Apple has had a new Underground Research and Development centre, located under ground somewhere in the Rocky Mountains. They’ve been trying to build a prototype of a personal transit vehicle, intriguingly called the iCar. The prototype did revolutionise transit by providing an electric car with completely closed windows and air-conditioning all at all times, but failed because charging it with the Apple Lightning Connector wasn’t such a great idea. A proposal to produce a prototype iBike was trashed because bikes were apparently too mainstream for Apple. A similar iBus prototype model was built, but it had the same problem as the others. After an intervention from the Government of the US, Apple worked on a prototype at Area 51 for an iPlane based iSpaceship. However, all of these were scrapped because of the Lightning Charger. Now, coming back to the iPhone 7. While most people think that removing the 3.5mm headphone jack was foolish, Apple has indeed, had other plans for it. The removal of the jack was to position a new microchip, which Apple calls iTransit. This iTransit chip, is also the reason behind Apple’s new AirPods. These new devices, which have a built in accelerometers and optical sensors, also feature a Revolutionary Thrust Engine within them. This new Thrust Engine, thankfully not called iThrust, will literally lift the user into the sky and fly them to their destination. The device shape will ensure that they don’t fall out of the user’s ears. The iTransit app, will track users realtime, and automatically make adjustments to prevent traffic jams and collisions mid-air. To travel, all one needs to do is wear the new AirPods, open the iTransit app [still in development], and enter the destination. 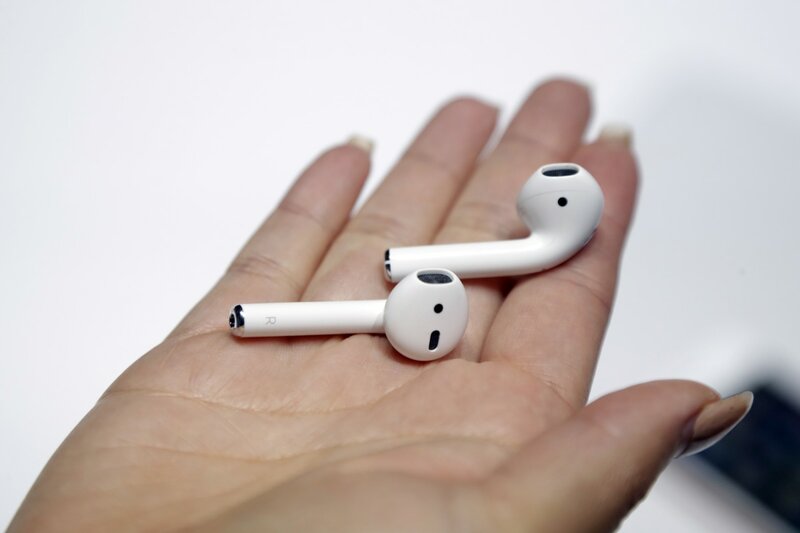 The AirPods, once they use the advanced technology to ensure that they are properly placed in the ear, will automatically power itself up and take the user to their destination. During flight, a user can use the AirPods as headphones as well and continue listening to their beats. iTransit can also be controlled using Siri. However, iTransit will be a paid service. While the App itself will cost $1.99 to purchase from the iTunes App Store, Apple will also charge users for using the service. Users can either pay for an unlimited plan, or a pay-as-you-use plan on a distance wise-basis. A free plan will also be introduced, wherein ads will be played during transit. Apple intends to market this to China where 100km long traffic jams have been experienced and India, because everybody from Bangalore is complaining about Central Silk Board. Once Aapil Saathukudinathan, managed to sneak his way out, for the Apple employee had passed out due to the smelly socks, he made his way to the Googleplex at 1600 Amphitheatre Parkway in Mountain View and later on to Redmond to the Microsoft head office. Alphabet immediately announced plans to put the Google Driverless Car on standby and start work on a new and updated version of Google Glasses called Google Fly which would allow people to fly, while Microsoft decided, they’d provide the software to Google for the new product. Aapil Saathukudinathan is now back in India, after having fooled the US and Indian authorities by flying without a valid visa. This post is dedicated to my Gurus, Ashwin S Kumar of The Unreal Times and Rahul Roushan of Faking News. I am taking my Alexa rank to the next level with Blogchatter. Current rank: 711432 globally and 61149 in India. Taxi and Ridesharing services in India have decided to upgrade their services in India to give a boost to the ailing market. Both Multinational entities as well as their local counterparts have decided to take the game to the next level. Uber and Ola have launched their new services: UberMob and OlaMafia, although it is unclear at this point as to who launched what first. Touted as the first legitimate Taxi service for Gangsters, both companies are looking to great successes with the new launch. On condition of anonymity, an employee at Uber stated, “We want Indians to experience the same feeling that people living on Staten Island experience.” When contacted, an employee of Ola retorted, “We just want our customers to experience an Uber ride in Delhi”. Industry sources stated that the two were keen on emulating an American local cab fleet that protested against Uber with taxicabs designed like cars owned by mobsters, complete with doors without handles on the inside of the car. Uber officials were rumoured to be deputing their notorious Delhi service provider range for this, while Ola has been said to favour its Bangalore fleet’s drivers. Excited Uber employees also leaked out news that the company was willing to try out something drastic, like attaching a city bus after Uber CEO Travis Kalanick was seen taking a ride in a BEST bus. Ola employees, coincidentally, within minutes leaked out plans to expand OlaBoats to include a submarine, specially for Mumbai and Chennai rains. Handicar from South Park. Image copyright Comedy Central. American Network Comedy Central announced its foray into the Personal Transport space with Handicar. Handicar, which formed the basis of a South Park episode, involves a Wheelchair user with a Cart attached behind it. Drivers wear a cap, known as a “Handicap”. Users are a provided a complimentary snack and beverage. A South Park Studios animator anonymously stated that the company intended to redraw the Handicar with Toon Boom, and print it using a 3D printer. Handicar drivers would also be provided with a Mask of Timmy’s face which would be fitted with a Voice box that would randomly yell “Timmy!” with different variations and tones. They were keen on starting the service in India because they liked the booming ride-sharing industry and the fact that it would be easy to run the vehicle without a permit. When contacted, Kyle Broflovski and Stan Marsh were unable for comment. Eric Cartman was attending the funeral of Kenny McCormick. Kenny was last killed when his orange parka got caught under the wheels of a Handicar. Recruitment is going on to hire mustached drivers for Mooch. 35 drivers have been selected so far, across a two week period, with many of them emerging from Kanpur and parts of Chhattisgarh as well as from the Satyamangalam forest which used to be the former hideout of the notorious bandit Veerappan. Training is being given to potential drivers to groom their mooch well. Started by a student as a dedication to his professor of a prestigious Media College, in Western India, B’Ve is touted to be an upper luxury hatchback service. While no major details are available at this time, it is rumoured that all drivers are to have long hair in a Bandana and drive Maroon-coloured Hyundai i20s. A rather cliched startup, this is a product of AyyoLabs. “We aren’t trying to imitate Mooch”, says founder Raghu Iyer. He adds, “(S)mooch is much more than ride-sharing. It’s life-sharing. It’s a combination of a ride-sharing app as well as a dating app. Couples looking for a ride are randomly matched on the basis of what they enter on their profile. The profile data is cross-checked and verified with their parents, and Kundlis. The service is right now only available for TamBrahms”. With such massive changes in the transport industry, we have a lot coming in in the near future. Apart from this, you also have the choice of taking Hawala Travels.